Monday, April 9, Paris – President Dalia Grybauskaitė met with President Emmanuel Macron of France at the Élysée Palace and attended working lunch of the French and Baltic Presidents. 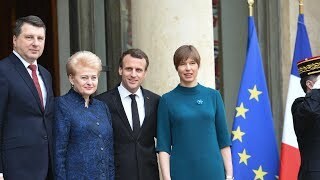 At the Élysée Palace, the leaders of the Baltic states discussed President Macron’s proposals on reforming the EU’s future, enhancing security and bilateral cooperation. According to Dalia Grybauskaitė, France under the vigorous European leadership of President Macron, pays special attention to Lithuania and other Baltic states. With the Community’s rebirth marked by new energy and ideas, Lithuania and France adopt decisions that are important for the future of entire Europe. This presents an opportunity for Lithuania to be better heard and stand for its interests. Dalia Grybauskaitė also underscored that a common responsibility for the future of Europe gave a new quality to the strategic partnership between Lithuania and France. This is a real cooperation that brings concrete results in the areas of defense, economy and culture. At the meeting, the main proposals of the President of France on the EU’s future reforms and key matters to Lithuania on the European agenda were discussed. Lithuania supports French initiatives to create Europe that is strong, innovative and competitive on a global market and to increase the Eurozone’s resilience to financial challenges as this translates into economic benefits to our people. At the meeting, Dalia Grybauskaitė also underscored Lithuania’s priorities in the negotiations on the new multiannual financial framework of the EU. French support is paramount for meeting Lithuania’s needs in the negotiations on EU financial support. Lithuania and France see security as the foundation of Europe’s future. To this end, the leaders of the two countries focused on defense cooperation and preparation for the approaching NATO summit. The position of France – one of the greatest powers of NATO – is important in securing additional Alliance’s defense measures in our region. Presently, French troops are also deployed at the multinational NATO battalion in Lithuania. At the meeting, joint response to hybrid threats and fight against international terrorism were in the focus. The resolve of both states to enhance European security played a determining role in launching the Permanent Structured Cooperation on security and defense (PESCO). Now, Lithuania and France assume European leadership in cyber security. France, which has an extensive experience in cyber defense, joins the EU cyber rapid response force, established on Lithuania‘s initiative. Both countries also jointly promote military mobility among EU member states. In response to the French request, Lithuania has enhanced its military presence in the United Nations’ mission in Mali and is taking part in EU training mission in the Central African Republic thus contributing to fight against international terrorism. The strengthening of bilateral relations was also on the leaders’ agenda. France has never recognized annexation of the Baltic states and has always supported their aspiration for freedom. France has preserved Lithuania’s interwar holdings consisting of 22 tons of gold. It refused to give them to the soviet occupants and later returned them to the independent Lithuania. Now, the two states enjoy economic relations that are getting stronger – the bilateral trade grew by almost 20 percent and reached 1.8 billion euros last year alone. However, there is a huge untapped potential for cooperation in financial technologies, life sciences and other areas. Culture and science relations are also important – Lithuanian and French scientists implement as many as 260 joint research projects, the popularity of French language is on the rise in Lithuania, 10 city-to-city partnerships are established. This year, Lithuania expects a visit of President Emmanuel Macron of France that would contribute to further strengthening of bilateral relations.